Get back to chasing tennis balls. The first kinesiology tape designed for dogs. Available exclusively to veterinary professionals. Say hello to RockTape Canine. The world’s best kinesiology tape is now for dogs. RockTape Canine is a kinesiology tape designed for the unique needs of dogs. Our unique tape can be used as either a sole or adjunctive treatment in canine therapy, helping to reduce and control pain, manage swelling and edema, increase joint range of motion and improve muscle function. RockTape Canine also helps maintain a level of functionality and comfort for the dog throughout injury rehabilitation. Keep your canine patients feeling their best through injuries with RockTape Canine Kinesiology Tape. Available exclusively through Patterson Veterinary. 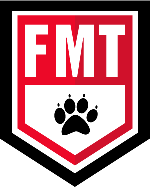 FMT Canine courses are now available! Join us for our first-ever FMT Canine course at Two Hands, Four Paws in Los Angeles, CA! Tap the button below to learn more and register. An online course is a pre-requite to the live certification! Follow RockTape on social media for new photos and stories from our RockTape Canine community! 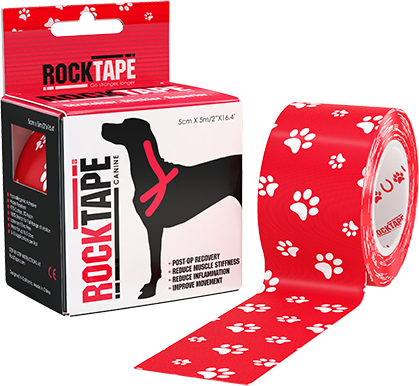 Meet the RockTape Canine Veterinary series, exclusively through Patterson Veterinary. Available in Black Logo, Black Paw, and Red Paw. Sizes: 2” x 16.4’ (5cm x 5m) • 2” x 105’ (5cm x 32m). Shop now. Learn the most advanced kinesiology taping techniques for dogs. Earn CEU’s by learning how to tape from leaders in the canine industry. Join top Canine Kinesiology instructors for our Canine Movement Taping course. 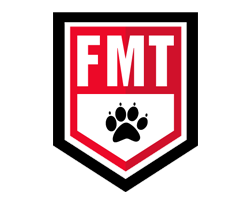 Our comprehensive FMT Canine course details the benefits and techniques for pain, inflammation and movement correction of RockTape when used on dogs. It is delivered in two sections. The first section is a 2-hour online course that is a pre-requisite to the hands-on course. The second section is delivered in an 8 hour hands-on environment with live animals where you will learn general assessment techniques and RocKTape application. Our FMT Canine course is perfect for veterinarians, vet techs, dog trainers, canine professionals, canine manual therapists. Supplies and canine study guides will be provided to all attendees. Join our exclusive RockTape Canine list to get notified of news, sales, and courses in your area! Feel free to reach out to us on our contact page! We’re always willing to help.